One of the goals of most Estate Plans is to maximize the value to those who inherit. IRAs provide one example why experienced advice is necessary. By following the IRS trust rules heirs can receive tremendous benefits from the tax deferred benefits of an IRA or 401k. 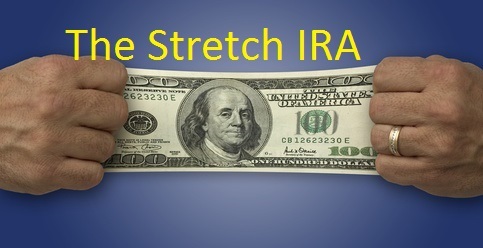 A Stretch IRA Trust can provide dramatic income potential to beneficiaries. There are special rules for how IRAs and 401ks can be inherited. Unless these rules are followed non-spouse beneficiaries must liquidate an IRA within 5 years. This may result in large tax consequences. The “Stretch” IRA Trust allows the beneficiaries to take smaller distributions over their lifetime. This prolongs the IRA’s tax deferral benefit. IRAs and 401ks are retirement plans that are funded during the working life of an individual. Income is allowed to accumulate in the accounts tax free. You must begin taking distributions by April 1 following the year in which you turn 70½. The tax laws require you to take Required Minimum Distributions or RMDs. The amount of the required minimum distribution is based upon the age of the taxpayer. The amount of the RMD is based upon the IRS life expectancy. For example for an an individual who is 71 must withdraw about 3.9%. The amount of RMD increases as you age. An individual who is 85 must withdraw about 7.25% and a 90 year old must withdraw about 9.62%. IRA has $500,000 balance at death. Beneficiary is 35 years old. The investment grows at the rate of 8%. The beneficiary lives to 80. The beneficiary would have received approximately $3.6 million in distributions and there would be a remaining balance of approximately $2,247,000 in the IRA. These results are possible because the monies continue to grow tax deferred. These results are based upon several assumptions and may not be typical. Using a general trust as a beneficiary. This may cause significant tax consequences. Failing name the IRA Beneficiary Trust as the beneficiary. For questions about this article or to find out more please contact Richard Winblad at 405.340.6554 for a Free Initial Consultation, or complete the contact form to the right.